Summing up its performance in 2018, Boryspil International Airport State Enterprise may confidently speak about the steady growth of its key performance indicators. Thus, this stable growth is better seen from a perspective of the last few years performance. 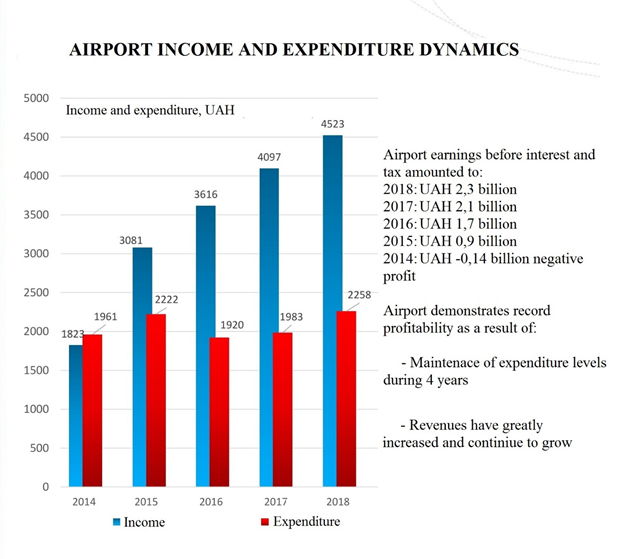 Analyzing the State Eterprise income and expenditure for the previous 5 years, we can see that in 2014 the Airport was a loss-making enterprise. However, eventually via reforming the expenditure items and working upon the income increase the Airport demonstrates its profitability. 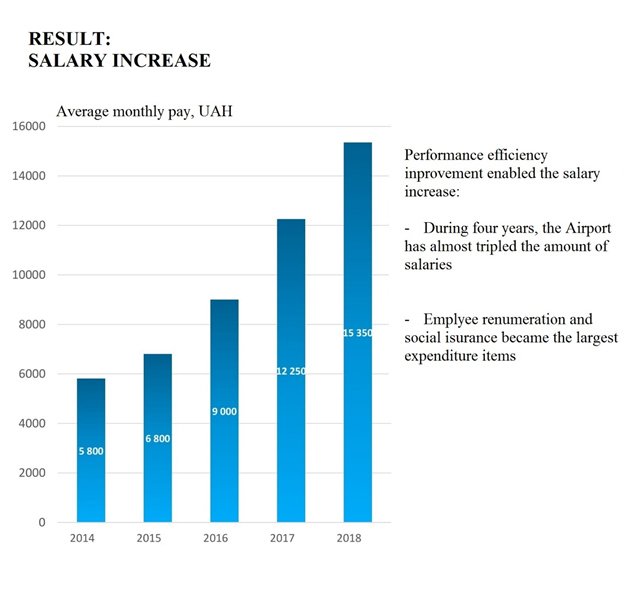 Thus, in 2018, the Airport earnings before interest and taxes amounted to UAH 2,3 billion, which is by 8,7% more than in 2017. In accordance with the financial plan for 2018, the Airport predicted 12,5 million passenger flow. By the results of the year, it amounted to 12,603,000 passengers. Such a minor difference between the predicted and actual index proofs the stable and the forecasted growth dynamics, enabling the infrastructural development, income and expenditure levels planning. Gradual annual growth of all passenger categories, and transfer in particular, is a sign of the hub development strategy success. Therefore, the number of the transfer passengers in 2018 increased by 16,8% comparing with 2017. Constant work upon expansion of cooperation with the air carriers led to the possibility to launch or renew our partnership with 10 airlines in 2018, which is the record in air partners involvement. It became possible as the result of the updated air carrier stimulation program. Thus, it resulted in 62 new flights per week and 25 new destinations. Among the largest air carriers operating flights at Boryspil Airport it is worth to note Ukrainian International Airlines, Wind Rose, Azur Air, Lufthansa, Turkish Airlines, YANAIR, Bravo Airways, Air France, LOT and El Al. In addition, Ryanair airline which joined in 2018 is also growing in intensity. Profitability increase and the enterprise management social focus enabled the pay increase. Currently remuneration and social security is the largest expenditures item.